The only collapsible menstrual cup Designed to fit your busy lifestyle, Lily Cup Compact is a new generation menstrual cup that collapses flat so you can carry it everywhere with you. Your period starting never has to be an emergency again! The medical-grade silicone is super soft and flexible for easy folding, insertion and total comfort during wear. Collecting menstrual fluid, rather than absorbing it, prevents dryness and irritation and there is no odor. This superior alternative to pads and tampons is both healthier for you and better for the environment. 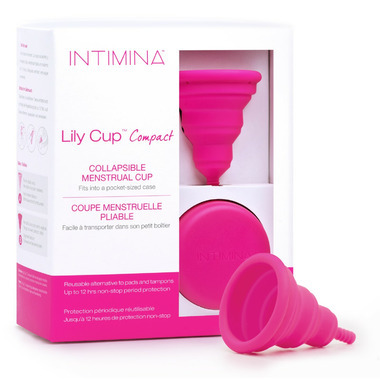 Lily Cup Compact is best for light to medium flow and gives up to 10 hours non-stop protection. Convenient - Carry it everywhere in its tiny case. Healthy - Hypoallergenic, no dryness, and no irritation. Respects your intimate balance. Comfortable - So soft and thin, it can't be felt while worn. No strings, no padding - wear whatever you want. Safe - Made from 100% FDA approved medical-grade silicone that is BPA-free and phthalate- free. No harmful chemicals or bleaches. Eco-friendly & Economical - Reduces waste: no more tampons or pads to throw into the waste basket. One cup can last for years. Sizes: Size A is recommended for women who have not given birth or for those who have given birth by Caesarean. Size B is recommended for women who have given birth vaginally or for those who have been diagnosed with a weaker pelvic floor.